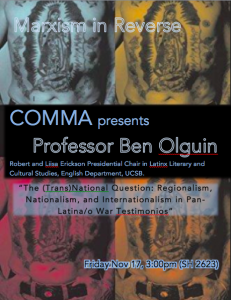 COMMA invites you to a talk by Professor Ben Olguin, Robert and Liisa Erickson Presidential Chair in Latinx Literary and Cultural Studies, English Department, UCSB. Professor Olguin specializes in Chicanx and Latinx Literary and Cultural studies, Critical Race and Ethnic Studies, American and Latin American Studies, Postcolonial Studies, Human Rights Theory and Praxis, Marxist and Materialist Theories. The talk is part of Prof. Olguin’s new book Violentologies: Violence and Ontology in Latinx Literature, Film, and Popular Culture.